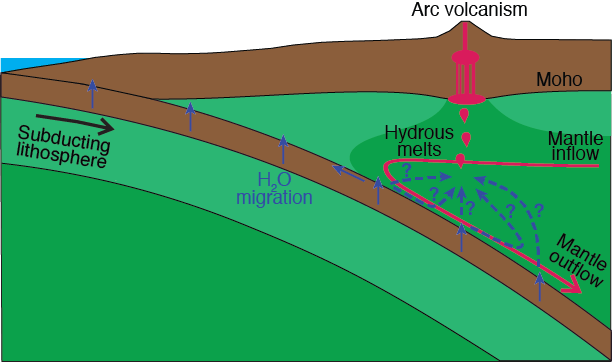 Magmas feeding arc volcanoes in subduction zones are mainly produced by hydrous melting of mantle rocks induced by the supply of water from the subducting slab . At the surface of the overriding plates, arc volcanism is only observed in a relatively narrow region situated at about ~100 km above the top of the subducting plate  while the release of fluids from the slab is predicted to occur over a wide region . This suggest non-trivial pathways of slab-derived fluids and/or magmas in the mantle wedge. More generally, the pathways of fluids within the slab and in the mantle wedge, as well as the location and extent of chemical interaction between fluids and mantle rocks are outstanding questions in Earth Sciences. During my postdoc at U. of Minnesota, I collaborated with Ikuko Wada (U. of Minnesota) and Cian Wilson (DTM Carnegie) to develop models of fluid percolation in a viscous porous medium to study the physical parameters that influence fluid migration in the mantle wedge. We showed that the spatial variation in both grain size and mantle shear viscosity in the mantle wedge can influence the pathways of slab-derived fluids (Fig. 2, Cerpa et al., 2017). We also showed that the pattern of fluid release from the slab and the fluid properties can affect fluid migration. Their variability among present-day subduction zones may lead to variations in the location and extent of hydrous melting in the mantle wedge [Cerpa et al., 2019]. Grove, T. L., Chatterjee, N., Parman, S. W., & Médard, E. (2006). The influence of H 2 O on mantle wedge melting. Earth and Planetary Science Letters, 249(1), 74-89. England, P., Engdahl, R., & Thatcher, W. (2004). Systematic variation in the depths of slabs beneath arc volcanoes. Geophysical Journal International, 156(2), 377-408. Schmidt, M. W., & Poli, S. (1998). Experimentally based water budgets for dehydrating slabs and consequences for arc magma generation. Earth and Planetary Science Letters, 163(1), 361-379. Cerpa, N. G., Wada, I., & Wilson, C. (2017). Fluid migration in the mantle wedge: Influence of mineral grain size and mantle compaction. Journal of Geophysical Research: Solid Earth, 122(8), 6247-6268. Cerpa, N. G., Wada, I., & Wilson, C. ( 2019 ). Effects of fluid influx volume and fluid viscosity on fluid migration in the mantle wedge and their implications for hydrous melting. Geosphere Themed Issue: Subduction Top to Bottom 2, doi:10.1130/GES01660.1.